Union Square Plaza in Somerville. This will be a Free outdoor All-Ages DIY Event with vendors selling all sorts of Vinyl Records and other Music Memorabilia and Equipment + Vintage and DIY Handmade Goods and more. There will also be Live Music all afternoon. Show Hours – 9 a.m.-3 p.m. 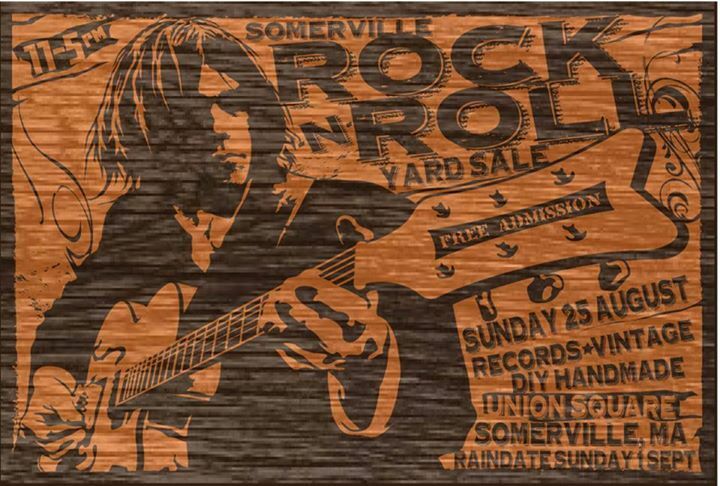 The Somerville Rock + Roll Yard Sale happens 25th August 2013. This Event will be held at Union Square Plaza in the Heart of Union Square in Somerville, Mass. The Event is from 11am-5pm and will feature Many Great Vendors offering Records + DIY Handmade + Vintage Goods. There will also be Live Music + a DJ Spinning Vinyl all afternoon. Somerville Arts Council (Somerville, MA) Our Sponsor! Miscellaneous Notes – Lots of dealers from all over New England and beyond with tons of older and newer vinyl for sale. LP\\\’s, 45\\\’s, CD\\\’s, Tapes, 78\\\’s and more. Rock, jazz, blues, psyche, soul, metal, punk, r&b, you name it. Special guest appearance by music figure to be announced later. of RECORDS, CDs, DVDs, videos, cassettes & ephemera. This will be a Free outdoor All-Ages DIY Event with vendors selling all sorts of Vinyl Records and Music Memorabilia and Equipment + Vintage Goods and lots of Handmade DIY Crafts and more. There will also be Live Music and DJs spinning Vinyl Records all afternoon. This event is sponsored by the Somerville Arts Council and is part of their ArtsUnion Program. This is the 5th Year that What Cheer? 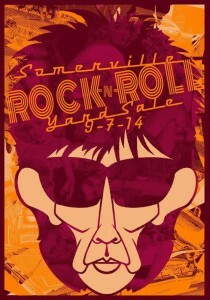 has collaborated with the SAC to bring the popular Rock And Roll Yard Sale to Somerville. What Cheer? has been doing their Rock And Roll Yard Sales for over 8 years now in Rhode Island and Massachusetts – including last year’s month-long residency at the Institute of Contemporary Art (ICA) in Boston, as part of their exhibit on Vinyl Records + Art. With a strong emphasis on Vinyl Records, these events have been part of a movement that has helped to make Vinyl Records popular once again (for the record, What Cheer? has been selling records since 1998). Some of New England’s best Record and Music Sellers will be at this event. They’ll be joined by a number of vendors selling Vintage and DIY Handmade Items, making for a unique shopping experience where attendees will find one-of-a-kind items available nowhere else. Silk Screened Posters + Promotional Items. There will also be lots of classy Vintage + Re-Fashioned Clothing + Accessories in addition to lots of amazing Local DIY Crafts. We’re in some really tough economic times these days, but the DIY Movement is growing, with artists and creative people are taking to events like this to find an audience for what they do. 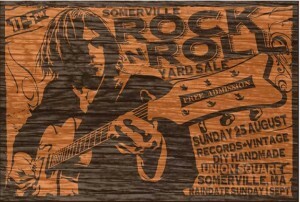 the Somerville Rock And Roll Yard Sale is ultimately about all of the great vendors that participate. This is a perfect way to support DIY & Independent Small Businesses! and Note that our Next Providence Rock + Roll Yard Sale is coming up on Saturday 15th September as part of a big outdoor event called the Neighbor Day Block Party which is being organized and put together by Narragansett Beer, WBRU, the West Broadway Neighborhood Association (WBNA) and What Cheer Antiques + Vintage. more info on this event can be found here. featuring thousands and thousands and thousands of records, CDs, DVDs, videos & cassettes. 34 YEARS AND STILL GOING STRONG – BOSTON’S BIGGEST, ORIGINAL, AND LONGEST RUNNING RECORD, CD AND MUSIC COLLECTABLES SHOW RETURNS – THIS SUNDAY WITH SPECIAL STOCK!! A Randolph Music Center tables EXCLUSIVE ! A truly exciting, never before offered unpicked collection of 50’s and 60’s vinyl collectables featuring rare and hard to find Doo-Wop and R&B LP’s and 45’s. Several hundred albums plus hundreds of 45’s from new to used, originals plus scarce reissues. Bring your want lists and find your missing gems! Promoters, dealers and venues lead complicated lives. It’s a good idea to call ahead before traveling to the show.